Pope Francis expressed this on the occasion of International Day in memory of the victims of the Holocaust, on his @Pontifex account, while he is in Panama for the WYD2019. Today is Francis’ final day of his Apostolic Visit to the Central American country to celebrate World Youth Day 2019, Jan. 22-27, 2019, marking his 26th Apostolic Trip abroad and 40th country visited. 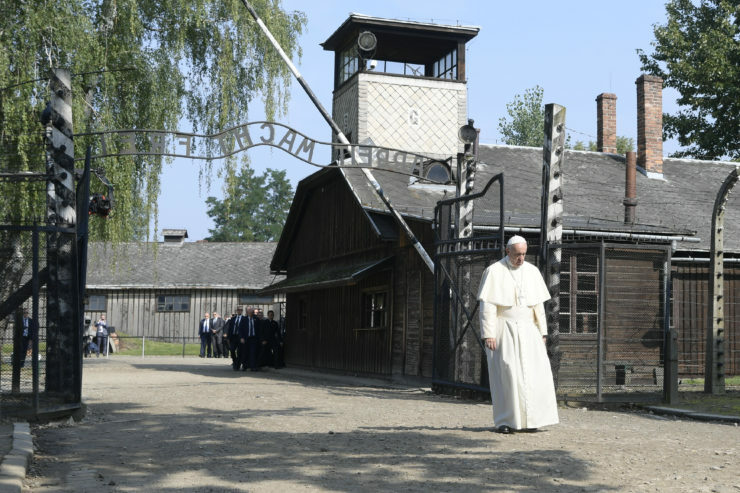 “Reminding the victims of the Holocaust is important so that this human tragedy is not repeated,” Pope Francis had already pointed out before a delegation of the European Jewish Congress visiting the Vatican on January 27, 2017. A question to which the Pope returned that day also in his daily tweet: “Today, I wish to remember all the victims of the Holocaust. May their sufferings, their tears never be forgotten. He pleaded for a “transfusion of memory” adding: “The Holy See attaches great importance and actively works in the field of education, especially in schools, to counter both anti-Semitism in general and the denial of the Holocaust in particular “. Popes John Paul II, Benedict XVI and Francis all went to Auschwitz, to the Holocaust memorial of Yad Vashem in Jerusalem and to the Great Synagogue of Rome. The International Holocaust Remembrance Day is held every year on January 27th, the anniversary of the liberation of the Auschwitz-Birkenau extermination camp in 1945 by Soviet troops: 7,000 detainees were there then, abandoned, while some 60,000 others were evacuated from January 17-21, 1945. On this occasion, commemorations and events are organized around the world. During his Angelus address, the Pope also made appeals for Colombia, Venezuela, Brazil and the Philippines.